Looking for an effective way to replace missing teeth? Are tired of your dentures shifting around in your mouth? If you are missing most or all of your teeth you have probably considered getting dentures, or you have them already. Like most of the patients who come to us with missing teeth, you might not like the way your dentures feel, or fit, and even how they look. As dentures age, they become worn and the face begins to collapse, giving you an older, tired and sometimes even angry look. A new, custom denture can help all of these concerns and give you the rejuvenated look of a natural facelift – without the surgery! Dental implants require very little maintenance other than regular and consistent dental hygiene and professional dental visits. You can care for your implant just like you care for the rest of your teeth. Even better, they function just like your natural teeth! 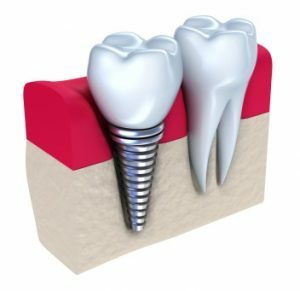 While many restorative procedures require replacements or additional restoration after several years, dental implants are designed to last a lifetime if cared for properly. Best of all, they won’t ever decay! ‹ Periodontal Disease and Diabetes— Not a “Sweet” Combination!